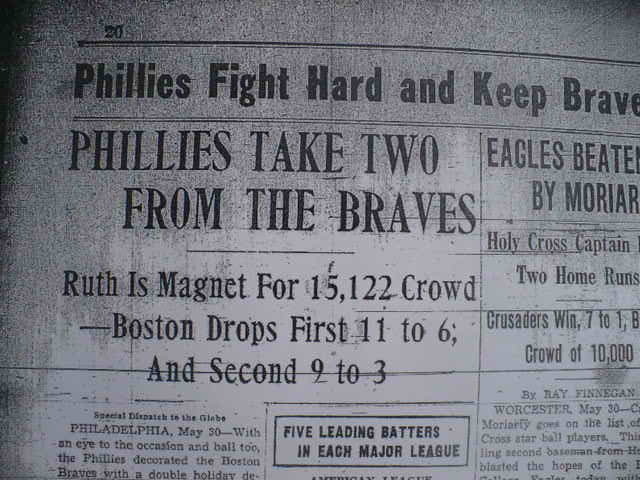 It was an 11-6 win for the Philadelphia Phillies, who played at home, in the Baker Bowl. Ruth played the first inning for the Boston Braves. Here’s the box score, and you can read an account of what Babe did as well. To briefly summarize: Ruth batted third and played left field for the inning. In the top of the first, he grounded out to first baseman Dolph Camilli on a pitch from Phillies’ pitcher Jim Bivin. In the bottom of the first, he apparently misplayed a fly ball from Phillies’ second baseman Lou Chiozza, failing to catch the ball and having the ball roll by him to the wall. Chiozza was thrown out trying for an inside-the-park home run, but a baserunner scored. thx, bro! Need this for National History Day!